I had walked past this place numerous times and finally decided to grab dinner with a friend. I was blown away how good the meal was. This is a high-end Mexican restaurant that deserves great accolades. I had the lobster tacos, which were amazing. 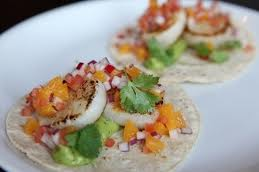 I’ve only had lobster tacos a handful or times, and these were the best. The guacamole was delicious also. The menu is packed with unique taco’s that I never know existed, such as beer Braised Tongue with Potatoes and Arbol Chile Salsa, and Hazelnut Fed Pork Loin with Braised Pine nuts. I forgot to mention the very extensive Tequila bar, which has tons to choose from. Now you can choose from something other than Patron; or you just may want to try the $90 glass of Gran Patron Burdeos.